Back in the day the coolest kids in town wore OshKosh B'Gosh overalls. Ok, when I say back in the day I mean back when we were all five and didn't have the faintest idea about making a statement for street style. Today, the trend has returned once again. Overalls aren't just for toddlers and farmers anymore. Oh no, this article of clothing has well and truly taken over the fashion world and is now a mainstay in posh wardrobes from here to Timbuktu. And the best part? There are 1,001 ways to interrupt this trend and make it your own, and the fashion world is really having fun at the moment doing exactly that. From supermodels boarding planes in overalls to magazine editors sitting front row in designer dungarees, the look is here to stay. That all being said, a stye guide came into being - 50 ways to wear your overalls - for those challenged in the ways of wearing onesies (of sorts). First things first - this is a style guide that is not limited to washed out denim only. Oh no! Overalls come in many different shapes, sizes, shades and fabrics. You'll find white, black, leather, silk, cropped, bellbottomed and more, and all put together in a way that would make Scott Schuman trip over himself to photograph you. It's all about the overalls, ladies. 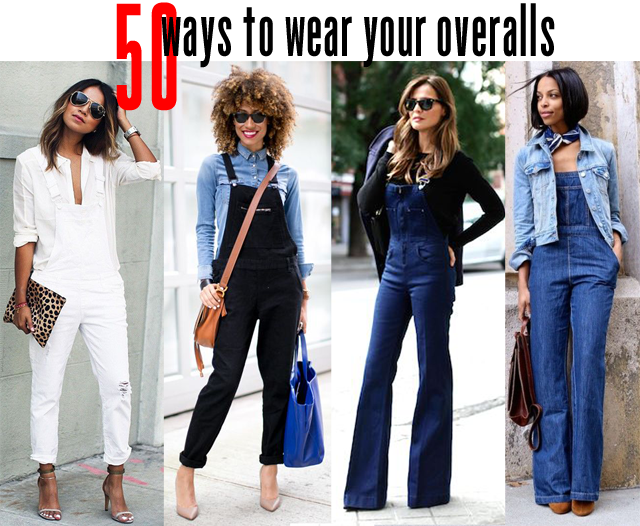 Now, onto the guide of 50 ways to wear your overalls... Naturally, it's in pin format, which will make it easier for you to scan and repin to style boards. Follow Fashion Foie Gras's board How to wear Overalls on Pinterest. And in case you are currently overall free, check out these top picks available to purchase now and put together perfectly with the looks you've seen put on display here today.